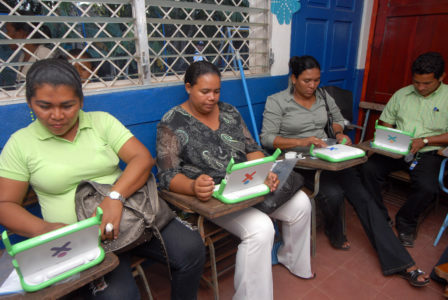 A key component of the OLPC education program is teacher training. OLPC’s experience in the field has evidenced the need to give teachers the skills and tools they need to seamlessly incorporate technology and innovative methodologies for learning into their daily lessons. OLPC partners with the Fundacion Zamora Teran to provide a comprehensive teacher training program to participating schools around the world. Our multidisciplinary teams focus on providing teachers with the skills they need to improve the academic and critical thinking skills of students. Our teams provide continuous support to teachers through workshops, in-class observations and individualized coaching sessions. These are designed to give teachers targeted feedback about performance in the classroom in an effort to encourage and support use of the innovative strategies introduced in the teacher training workshops. Our teams provide support to schools and teachers each month throughout the school year. For more information, send an email to information@laptop.org. Thank you for your support for the OLPC Education Program! How can you provive it and what would be the cost? Thank you for your comment! We can provide teacher training on the ground or remotely, depending on the needs of each program. Please send us an email at information@laptop.org for more information! Next Next post: Happy Teacher Appreciation Day!